I've been enjoyed playing electric guitars at home for a long time. Based on the experience I learned in the Hi-Fi audio, I realized that I become quite picky on the tonal performance, not only in the music reproduction (Hi-Fi) and also in the music production (instruments) as well. A few years ago, I got a Mesa Boogie Express 5:50 guitar tube amp as one of my guitar amp at home. It is always a pleasant experience in playing with it, but I was always worrying about my neighbor might kick my doors if I crank the volume up. This is a very general problem on the guitar tube amp. Except for those guitar amp models with an OUTPUT knob such as Mark V or LoneStar, for models with MASTER volume only, it is a headache to reach the tonal headroom while also maintaining the volume within an acceptable level. 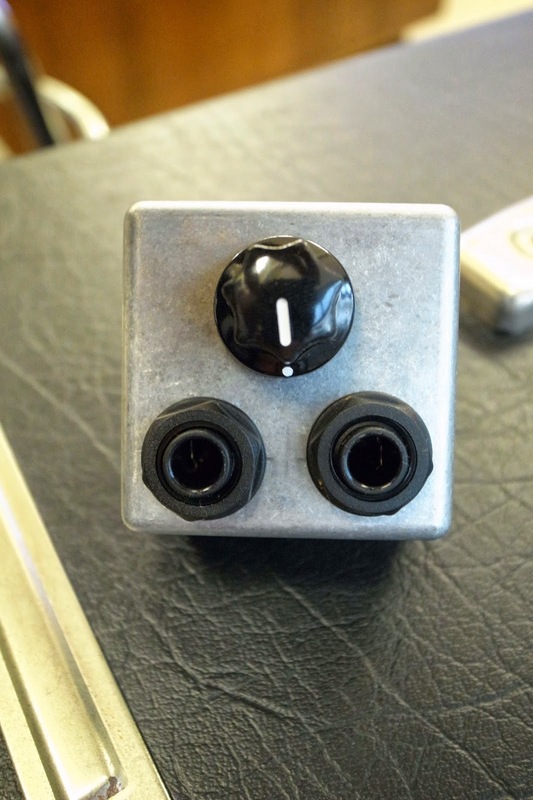 The project here is how I manage to solved the problem by creating a volumne adaptor for my guitar amp. 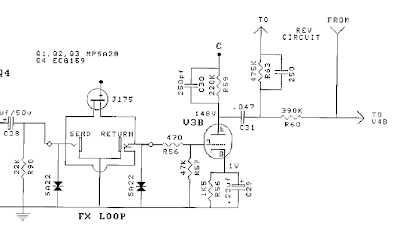 I did a little research on the guitar amp schematic on the Internet. 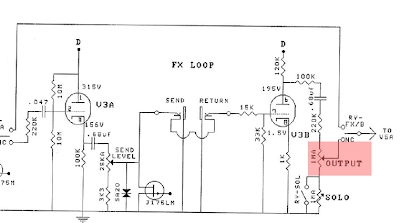 We can see that on the amp with OUTPUT design, an OUTPUT potentiometer (1M Ohm Type A in the above case) is installed in the signal path after the RETURN connection point. 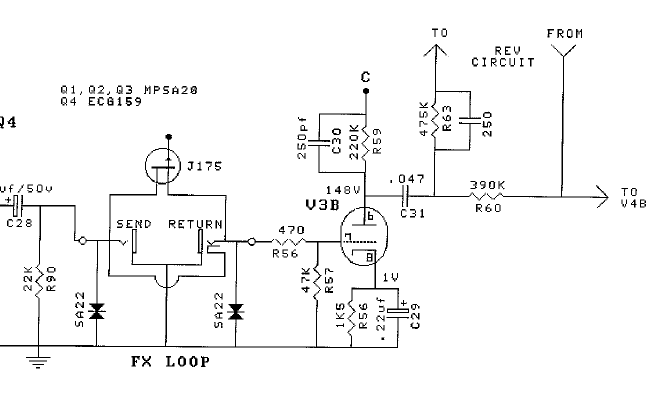 I then take a look at the schematic which I can find on the Internet for Express 5:50. 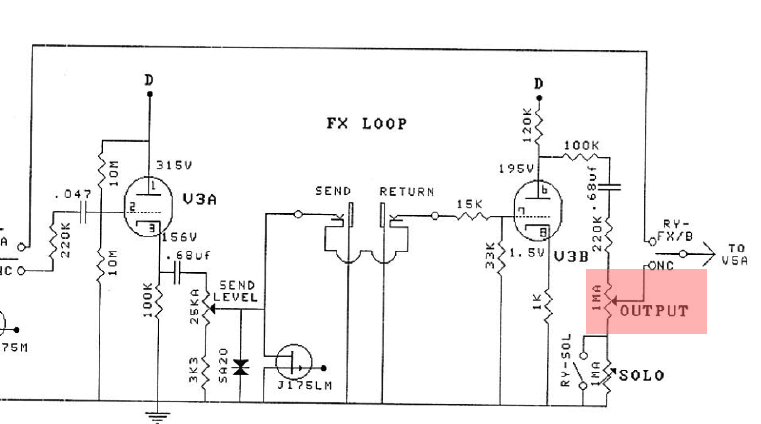 The FX Loop circuit of Express 5:50 didn't have such POT for controlling the OUTPUT volume. Hence I came out with an idea: why not installing a POT in between the FX Loop to introduce the OUTPUT control? 1. I don't want to do any physical modification on the guitar amp. 2. To make the OUTPUT volume adjustable, a POT is required. But I don't want to drill a hole on the chassis of my guitar amp. 3. The solution must not block the FX Loop, since I need to use the SEND/RETURN to send the signal to other sound processors in my setup. 4. No external power is required. 5. Keep the dimension as small as possbile. I decide to make an "adopter" as the solution. Actually we don't need all components, just the main jack assembly will be good enough. The sockets here are intended for create the EXTENDED SEND/RETURN connections. Note the structure of the socket, when you plug in the phone jack, the connection pins on the left will be isolated to the connection pins on the right. The reason for using this type of socket is to make it possible when there is no cable connected to the EXTENDED SEND/RETURN, the signal will be kept in the adopter, and when FX Loop is required, I will still be able to send the signal to other processors by EXTENDED SEND socket and get the signal back by connecting the cable from the processors to the EXTENDED RETURN socket. Note the potentiometer shoud be installed AFTER EXTENDED RETURN socket. The reason is, if the FX Loop is required, we can always use the existing MASTER pot to control the signal level. But when the signal retured, we will need to control the level by OUTPUT pot here. For sure we need to drill holes, so be careful on measurement, keep the error as small as possible. Here are some pictures for the construction. To use it, just plug it in the SEND/RETURN socket on the back of Express 5:50. And then adjust the original MASTER knob on the amp and the OUTPUT knob on the adopter to find the balance. The best way to do this, is to connect a cable from the EXTENDED SEND on the adopter to your sound processor INPUT, and adjust the MASTER to make sure the signal level is high enough for the processor input. And then connect a cable from processor OUTPUT back to the EXTENDED RETURN on the adopter, and then adjust the OUTPUT potentiometer on the adopter to get the reasonable volume. The best thing is, if you don't like, you can always remove it from your amp at anytime. Thank you, just hope that can help people who have the same problem.